Every country, including Canada, has based their climate and energy policy on the Reports of the United Nations (UN) Intergovernmental Panel on Climate Change (IPCC). The most influential Report to establish global warming as a serious public issue appeared in 2001. It contained the infamous “hockey stick” that Richard Muller called, “the poster-child of the global warming community.” Despite the certainty with which the hockey stick was promoted that showed no warming for a few hundred years then a sudden upturn in the 20th century, the accompanying but separate Physical Science Basis Report, contained the following. That statement alone disqualifies the IPCC work as the basis for public policy. However, the statement does not appear in the Summary for Policymakers (SPM). It is a document designed to influence public policy and differs remarkably in a multitude of ways, both in inclusions, omissions, and emphasis. The SPM is written by a separate select group of politicians and bureaucrats and released at a world press conference. The separation is done deliberately to make it virtually the sole source of information for the media and the public. A few months after they release the SPM, the Physical Science Basis Report is released with no fanfare. By that time, the certainty and alarmist perspectives of the SPM are entrenched in the political and public minds. Those controlling the IPCC know that very few people will read the Science Report and even if they do they will not understand. The few that do understand and point out the problems, like me, are easily marginalized as skeptics or deniers or worse, in the pay of “big oil”. There are many things wrong with the hockey stick, but just a couple of points will illustrate how it is completely false. 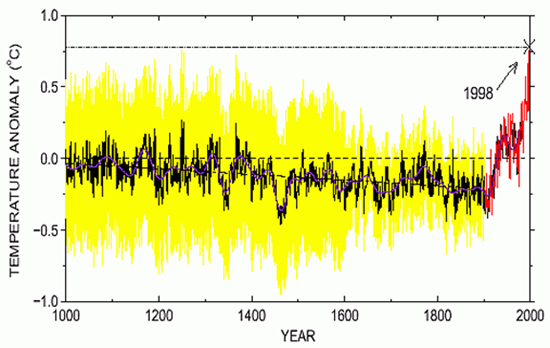 The yellow highlighted “handle” is the temperature produced from tree rings, but they are a function of precipitation. Everyone knows that water is far more important for tree growth. The red portion, the “Blade”, is the 20th-century instrumental record, incorrectly tacked on. But that is only part of its problem. It was tacked on because the tree ring graph started to decline. They couldn’t allow this as it contradicted their claim that temperatures were increasing due to increased human CO2 production. The phrases used in emails leaked from the Climatic Research Unit (CRU) at the University of East Anglia, which was where the hockey stick was created, tell the story. They talk about “hiding the decline” that is covering up the decline tree ring record. Then they carried out Mike’s Nature Trick, which is the reference to tacking on the instrumental record as he had done in a paper published in the scientific journal Nature. Increased by 0.6±0.2°C over the 20th century; land areas warmed more than the oceans. They claimed that the 0.6°C increase was larger than any in the climate record and, therefore, must be caused by human additions of CO2. That is simply not correct, but we can’t confirm the claim because a request from Australian researcher Warwick Hughes for the data elicited this response. Later when pushed through Freedom of Information requests Jones announced he had lost the data. Regardless of that, most people missed the fact that the error range of his results ± 0.2°C or ±33%. The numbers are meaningless, but achieved their political objective. Ask yourself, would a media outlet use results from a political poll with such an error range? Deliberate disconnect between the Summary for Policymakers (SPM) and the Science Report, The Physical Science Basis, has convinced mainstream media and politicians that global warming is a problem. They didn’t even catch on when the fundamental assumptions of their science that increasing CO2 would cause increasing temperature was contradicted. From 1998 on global temperatures stopped increasing but CO2 levels continued to increase. Instead of revisiting their science they simply changed the terminology, global warming became climate change and skeptics became deniers. The greatest deception in history continues apace and lies, misinformation and eco-threats will reach a crescendo for the November 2015 Climate Conference in Paris.